Welcome to your new position as Minister of the Environment and Climate Change. Unfortunately, Minister Glen Murray has left you an extensive list of action items requiring your immediate follow-up. We highlight the key issues for you in the following list, related to Ontario’s energy policy and wind power projects. White Pines – Withdraw the Renewable Energy Approval for this project as developer wpd cannot meet the terms of their contract. There are significant environmental concerns with this project that remain, even after a successful appeal by citizens before the Environmental Review Tribunal. Amherst Island – Rescind Renewable Energy Approval for this project which is planned for the tiny island heritage community. Significant environmental risks are present including the serious impact on migrating birds that congregate in this area; Ontario does not need the power from this project. Saugeen Shores – The single wind turbine at the Unifor educational facility has been fraught with problems and engendered hundreds of complaints about excessive noise. This turbine would not be allowed under present regulations. You can immediately address the failure to meet a June 30 deadline for submission of a compliance audit report. K2 Wind – This is another wind power project, a large one, with many problems in its relatively short history. You can deliver on Minister Glen Murray’s mid-May commitment to Black family, and others, to provide a solution to wind turbines that MOECC testing indicated were not compliant with Ontario regulations to protect the environment and health. Address Concerns Raised at Request of Minister Murray – Many people across Ontario took Minister Murray at his word when he said that there were no complaints reaching his office and that he would ensure his officials responded quickly to address the issues. They wrote to him and are still waiting for action on their issues. 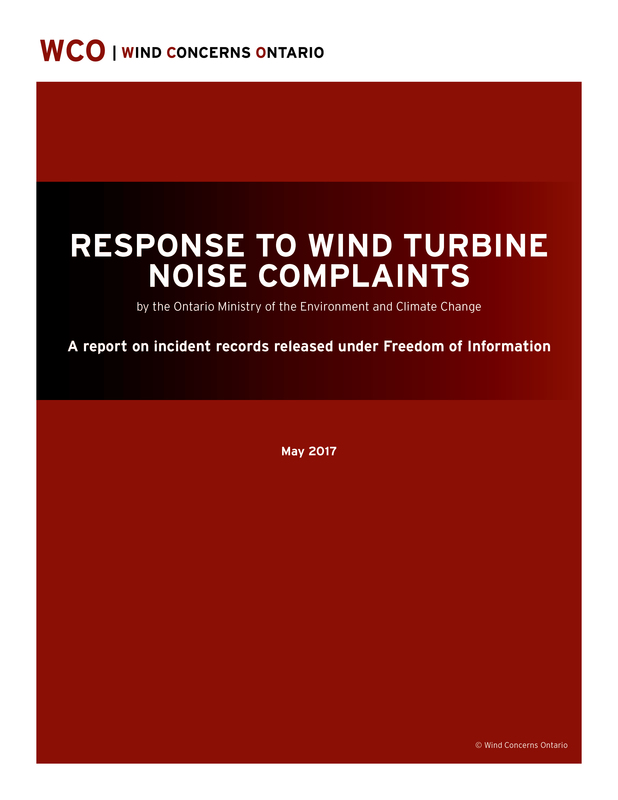 Complaint Tracking Process – Complaint records released to WCO in response to an FOI request indicate that the MOECC does not respond to most complaints about wind turbine noise. These complaints should be a source of learning for the Ministry rather than being ignored as currently appears to be the case. A full revision of the process is needed to ensure that complaints are actually resolved with procedures that allow the Minister’s office to track resolution. MOECC records indicate little or no resolution of more than 3,100 formal Pollution Reports made by Ontario citizens between 2006 and 2014. REA Approval Process – Increase setbacks from residences to reflect learning from MOECC complaint records that include staff reports that confirm that current regulations are not sufficient to protect health of residents living in wind projects. Last week, the Supreme Court set out standards for consultations with communities which are substantially more rigorous that the standards used for Ontario Renewable Energy Projects. MOECC Noise Modeling Procedures – implement new noise modeling procedures based on MOECC internal testing that demonstrates wind turbines routinely exceed predicted levels. Otter Creek – Retract decision to deem this application “complete” for the Renewable Energy Approval process. The proponent is unable to provide noise emission data for the turbine equipment proposed. The noise report submitted with the application for a REA is not grounded in fact but rather is estimates based estimates. Also, a full MOECC investigation of the impact on well water is required. LRP I Contracts – suspend REA process for remaining LRP I projects until full review of requirements based on internal complaint records is completed. Noise Compliance Audit Protocol – Expand the wind speeds covered under the protocol to include wind speeds below 4 metres/second which are the source of a substantial portion of complaints about excessive noise. Even MOECC testing shows these wind speeds are the source of noise levels exceeding 40 dB(A), which completely undercuts the credibility of this audit process. REA Enforcement – REA terms make the project operator responsible for addressing the concerns raised in each complaint to ensure that it does not recur. The MOECC needs to follow up on all operating with projects to ensure compliance with these terms and take action where it is not occurring. Shadow Flicker – The flickering shadows produced when a turbine is positioned between the rising or setting sun is a major irritant for residents. It is not considered in the REA approvals and is easy to address by turning off the turbine for the times when it is casting moving shadows on a house. In some projects, these changes have been implemented by the wind company but in other MOECC staff is telling residents no action is required, even though the REA requires the wind company to address complaints like these. 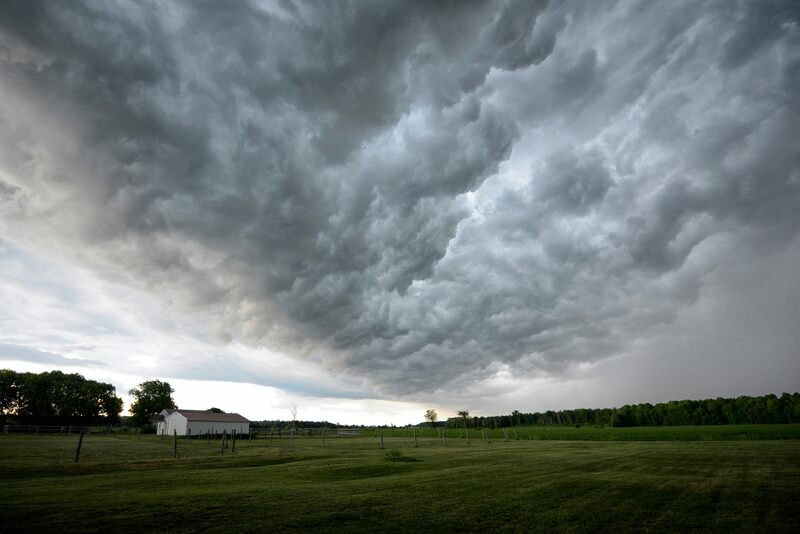 Infrasound – Expand MOECC testing to include the full range of noise emissions from wind turbines as independent testing shows the presence of elevated levels of infrasound in homes where residents have had to leave to protect their health. Health Studies – The Ministry has been telling residents that its policy is based on the “best science” available since the first turbine projects were built. MOECC records clearly show that this is not correct, but the Ministry continues to be willfully blind to input from both residents and its own staff, quoting dated and selective literature reviews in a field where the science is rapidly evolving. The need for noise studies and other investigation has been highlighted in numerous reports but never undertaken. It is time for some serious field studies of the problems being caused by wind turbine projects in rural communities across Ontario. This was an information gap identified in 2010 by the Chief Medical Officer of Health. Last, it is important that as you prepare for this major portfolio, you understand that industrial-scale wind power generation offers no significant benefit to the environment. Wind power generation on this scale is a high-impact development for little benefit, if any. Two Auditors General for Ontario recommended that Ontario undertake a cost-benefit and/or impact analysis — that has never been done. We ask you to approach this issue with honesty and honour, and respect the wishes of the citizens of rural Ontario. Wind Concerns Ontario is a coalition of community groups, individuals and families concerned about the impact of industrial-scale wind power development on Ontario’s economy, the natural environment, and human health. Last week, Ontario Premier Kathleen Wynne visited Chatham-Kent and was met by protesters with a variety of complaints about her government, including high electricity bills, and the problems with water quality possibly due to vibrations produced by wind turbines in the area. Energy Minister Glenn Thibeault also met with citizens in Chatham-Kent, and promised that complaints would be dealt with by the Ministry of the Environment and Climate Change (MOECC). This is the same government, indeed the same ministry, that promised to deal with reports of noise and other effects from industrial-scale wind turbines. 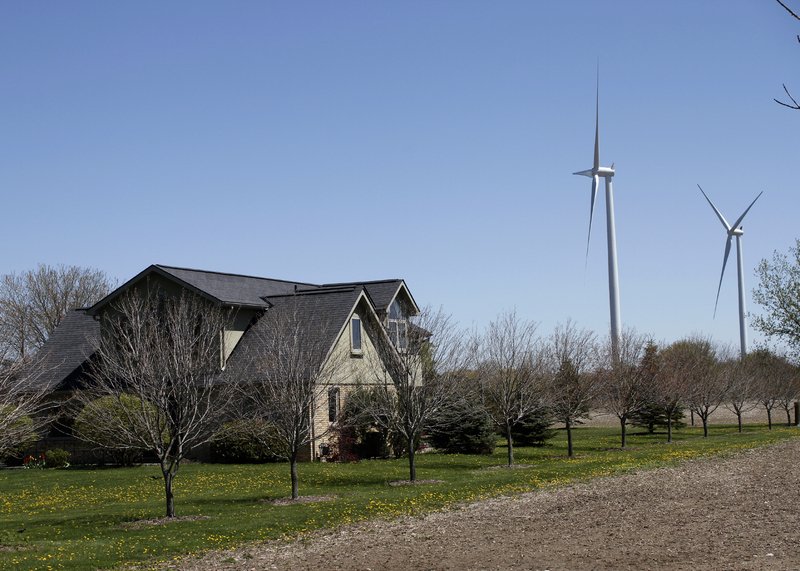 The fact is, according to the MOECC’s own records, obtained by Wind Concerns Ontario under Freedom of Information and Privacy legislation, the government knew in 2006 there were problems being experienced by people living near wind turbines. During the years 2006-2014, more than 3,100 formal reports were recorded, many of which entailed so many complaints that large “Master” files were created. The result? NO action in 54% of the files, “planned” action in 31%, and deferred action in 14%. Only one percent of the files got “priority” response. To this day, compliance audits are not filed, resident reports of noise pollution and health impacts (noted by MOECC staff in 59/100 master files) are not acted on, and instead of listening to and acting on citizen concerns as promised by Premier McGuinty, the MOECC’s “client” is the wind power industry …. not the people of Ontario. Despite claims by Minister Glen Murray that there few actual reports, and a promise of action on the ones he does have, little substantive action has occurred since the release of our report May 31, and the airing of a Global News investigative report in June. Moreover, in a clear demonstration of willful blindness, the government persists in granting more contracts and approvals to new wind power projects. Glasses of black water in Chatham-Kent make it easy to see that there is a problem, but we still see no accountability in this government, or the MOECC.